Julia Childs says the secret to French cooking is butter, butter and more butter. That's how I feel about garlic. It's a staple (besides onion) to my every dish, but sometimes I like to switch things up a bit. What better time to try new things than in the summer, when there is such a variety of fresh, Ontario produce. There are 2 general types of garlic: Softneck and Hardneck varieties. 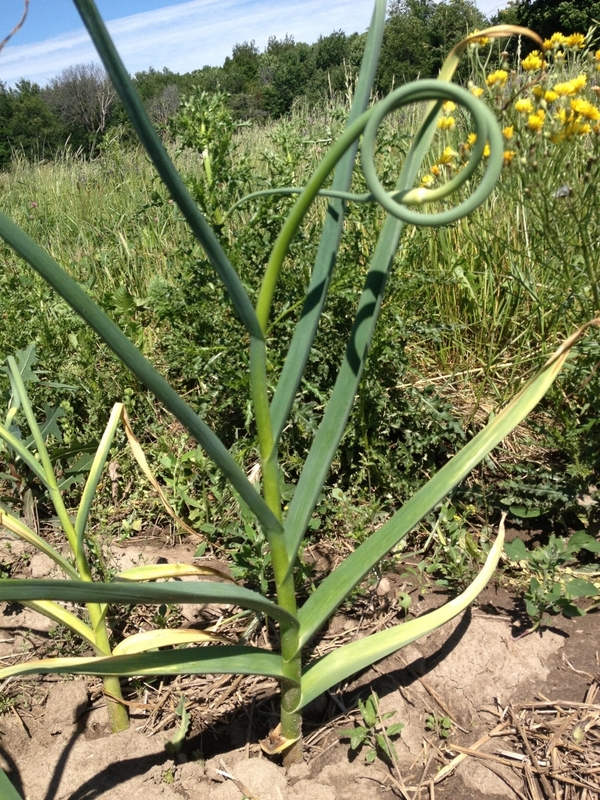 Garlic scapes are the stalk flower of the latter (although it does not actually produce a flower). They are usually cut off to ensure more vigorous bulb production. If left on, the strength of the plant is split between the growth of the scape and the bulb, and the bulb doesn't grow as big. 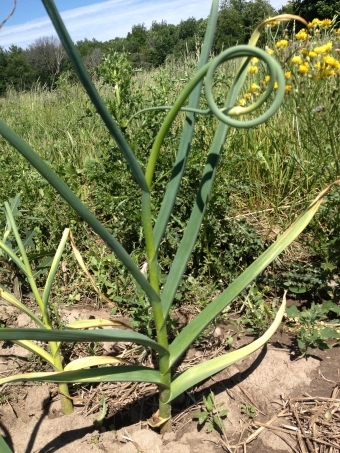 Most garlic growers will just toss them in the compost, but garlic scapes are both edible and flavourful just like garlic bulbs. Garlic scapes are a bit of a cross between garlic and scallion with a mild garlic flavour and are fantastically versatile. They can be eaten raw or cooked. The smaller, more tender scapes are preferred when eating raw. You can slice it up on a salad, or use as a garnish like you would green onions. If you are a pickling fan, you've just found another veggie great for the jar. Just remember to snap off the ends before using as they are tougher than the rest of the scape. The larger the scape grows the more fibrous is becomes, so these ones are best when cooked. Use it as you would garlic; sautee and enjoy in any dish. Throw it in a roast for a distinguishable garlic aroma (make sure to break it up to let the flavour out). They are fantastic grilled, steamed or made into a soup. Put the scapes, cheese, almonds and half of the olive oil in a food processor. Once finely chopped and blended, add remainder of the oil. If you like the texture, you're finished! If you'd like it a little thinner, add a bit more oil. Season with salt. If air sealed, it will keep well in your fridge for a few days. Or if you'd like to keep it for later use, freeze it and use it within a few months. Garlic scapes will keep in the fridge for a few weeks. And if you got overly excited and picked up too many, throw them in the freezer for later use.